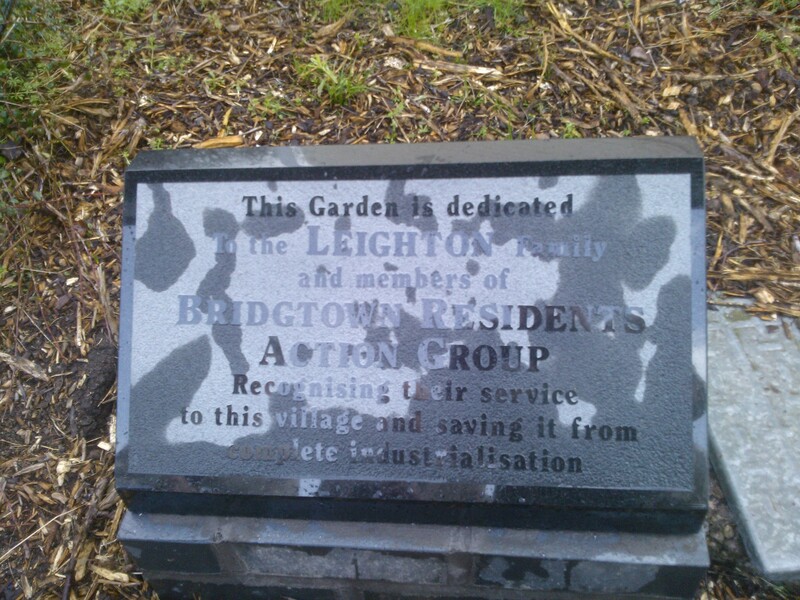 Despite the inclement weather many people turned up to witness the Dedication of the garden now known as the Leighton Garden – commemorating Dora & Jim Leighton who both did much for the village and also remembering the Bridgtown Residents Action Group who helped stop the village being demolished and turned into a massive Industrial Park. The Vicar of Bethel Church, the reverend Edwin Myers, led the dedication and there was a speech by Parish Council Chairman, Mr Eddie Smith. 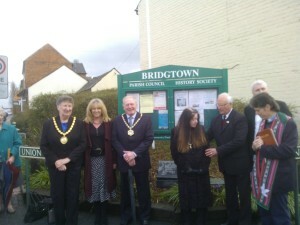 Among those present was County Councillor for Bridgtown, Alison Spicer, Parish Councillors Eddie Smith & wife Sue, Maureen Freeman and John Kraujolis, Mr Bob Leighton his wife Becky and Jim Leighton’s son representing the Leighton family and Mrs Jeanette Cartwright, representing the BRAG contingent. 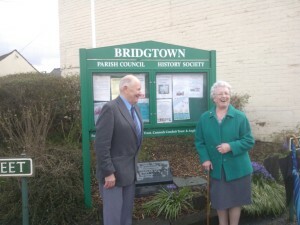 There was a welcome visit from former Society Chairman and now life member Mr Tony Pearson and wife Anne. There was also a good turnout from the Society, many of whom were also present as members of the Church, former BRAG members and other groups. The unveiling took place and then all went to the Bethel Church where there were short speeches by Mr. Eddie Smith who read out a prepared speech from Mr. Barry Cartwright ( first Council Chairman of the Parish), Mr. John Devey for the Society and a poigniant speech from Mrs Peggy Greenway. There was a grand buffet laid on and the vicar gave Grace. The talk at the Bethel this morning was an enlightning and amusing one given by member Mr Peter Bates who was aided and abetted by some of other well known Longfordites and a few memory jogging photographs. A change of Telephone numbers for the Member Secretary (Bob Brevitt) has caused a few problems with the team as Bob (Me) didn’t give any notice so all thought I’d gone into the spy business. My new number for those predisposed to calling me is 01922 411942. The Contacts list has been updated. The Bridgtonian for Spring 2016 is now out and being distributed. As membership lapsed at the end of March, we will be ceasing to send to those not renewing after this issue. So get your membership renewed ASAP as the Bridgtonian for non-members costs £1.75 . 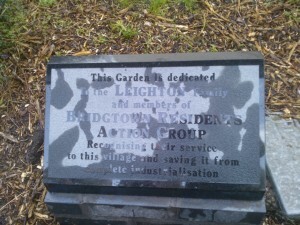 The War Memorial page on this site has now been updated and only a few names have no history. Anyone who could help us update those and indeed, if somebody spots any mistakes in those already updated please get in touch with Bob Brevitt – Contact details on the Contacts page. I feel all those on the Memorial should not remain unrecognised. Anyone with family members who were involved in Military operations – we are trying to get enough material to provide a display in the future and are in need of more photographs. Not a great deal to note this month. Mr David Battersby has been in the wars after a fall but has bounced back and now is as good as ever – ish. The Diary for this coming year is filling up and the next 2 events are close by. The Heritage Service at the Bethel is on sunday 17th April 2016 led by our own Sheila Jackson & John Devey and that is followed on Wednesday 20th April 2016 – 10.00am til noon at the Bethel by another local speaker, Mr Peter Bates, who will talk about his childhood stomping ground of Longford Road. As you know we now have a base office, kindly provided by Mr Fred Pritchard, in Virage Tower and most of our photographs now have a home there where we can continue to database them. Anyone with computer skills who would like top help out with that job, we would like to hear from you. Please call one of the team (please see the contact us page ) and they will take your details and we can arrange a plan of action. The Bridgtown Showband have once again agreed to help us out with our fundraising and a Concert billed as a “Tribute to Dora” will be held in June at the Bridgtown Sports & Social Club, Walsall Rd and we hope that many of you will support us and have a great nights entertainment to boot. The date and time will be advertised when fixed but may be Monday 13th or 20th of June 2016.